Fascioliasis (fasciolosis) - helminthiasis of the liver and gall bladder caused by trematodes (flukes) SEM. Fasciolidae. 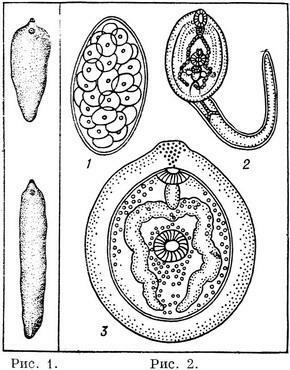 Pathogens - Fasciola hepatica up to 3 cm and Fasciolidae gigantica length up to 7 cm (Fig. 1). Fig. 1. Hepatic Fasciola (top) and the giant Fasciola (bottom). Fig. 2. Stage of development of hepatic Fasciola: 1 - the egg, 2 - cercariae; 3 - cyst. The adult Fasciola parasitize in the gallbladder and bile ducts man, large and small cattle and other mammals. With faeces cases of fasciolosis people and animals are released eggs fasciolae. By ingestion of eggs into the water after 4-6 weeks of them overlook the germ, which penetrate into shellfish - small pond snail and other shellfish is the development and reproduction of larvae fasciolae (Fig. 2)ending with access to water tailed maggots - cercarial. Last lose the tail and incestious on water and plants. Contamination of fasciolosis happens if swallowed these larvae of water and eating growing in water plants. The clinical picture. The incubation period - 1-8 weeks. The disease begins with increasing weakness, headache; often marked urticaria, fever, abdominal pain, enlarged liver; sometimes jaundice appears. In the blood - eosinophilia. Gradually acute effects subside, the disease becomes chronic. There diarrhoea phenomenon, pressing or attacks of abdominal pain. The liver is often enlarged and consolidated. Complications - purulent cholangitis, abscess of the liver, jaundice due to blockage of the fasciolas bile duct. Diagnosis at an early stage of the disease is very difficult. In 3-4 months. once infected find eggs fasciolae in the stool and duodenal juice (Fig. 2). Perhaps the presence in Calais so-called transit eggs, caught in the gastrointestinal tract of humans by eating fasciolasis the liver of cattle, and passed through it without changes. In this case you need to re-study of Cala 1-2 weeks after the complete exclusion of the liver from the diet of the patient. Forecast in case of timely detection and treatment of human fascioliasis favorable. In severe cases, especially when a secondary bacterial infection, can be bad, up to a lethal outcome. Prevention. Water should drink only boiled or filtered through the canvas; vegetables and herbs is thoroughly washed and scald with boiling water.